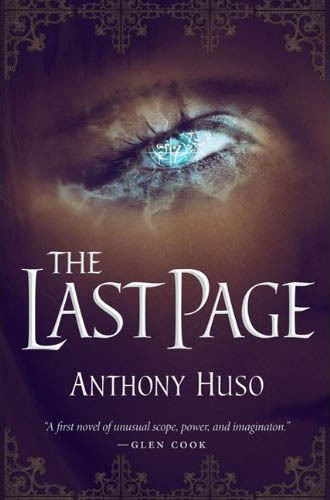 Last month I was quite blown away by Anthony Huso's spectacularly weird The Last Page. 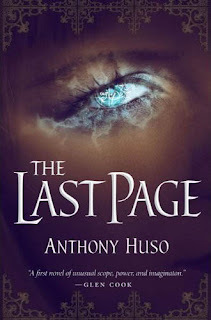 Soon after finishing I had no doubts that I'd ask Anthony for an interview as I wanted to learn about his motivations for writing and the creation of this world. I found him to be open and frank, which usually portends an entertaining interview. Read on. MH: Thanks for taking the time to answer my questions. HUSO: No problem. I'm flattered anytime anyone wants to talk to me, even in the street. MH: Firstly, I've already gushed a bit about The Last Page, but it is a bit difficult to describe. To one friend I called it a Dark Fantasy with a love story where the lovers are hooked on each other like crack tinged with Lovecraft monsters and airships? How do you describe it? HUSO: Frankly it's probably just as hard for me to describe. Not the plot, but the nature of the book. I think you're right in calling it a dark fantasy. It could also be called new weird or whatever. The important part, for me, is that it *is* weird. I attribute this to several things. First of all, I like to play with the expectations associated with labels. A love story is essentially a label, and you're right, there is a love story here, and it's central to the plot. But it's also a dysfunctional love story. It doesn't follow what I would expect from a love story's path. And it doesn't pretend to be the most important thing going on. Nevertheless, underneath the monsters and spies and esoteric books, the love story is the backbone of the, er...story. We like labels because they make it easy for us to talk about things. We say a label and the person listening understands instantly what we mean. But in The Last Page, that is (by design) harder to do because of the way I like to play with those expectations. Sena is a witch, but she's not a witch-archetype and when you call her a witch, at best you're only communicating a fraction of the truth. At worst, you're actually leading your listener astray. Caliph likewise is a prince, but I'd argue that label terribly mis-contextualizes who he really is. Many things in the book are like this: on their head so-to-speak. You get into trouble even saying something as simple as "Sena and Caliph rode a horse up to the Howl estate," because is it really a horse? The downside of this, is that selling the idea of buying the book to a friend in the elevator is a bit of a chore since the labels you're tempted to used don't exactly fit the experience generated by the text. The other reason I think the book is "weird" is that this isn't medieval European fantasy. Nor is it urban fantasy. Nor is it steam punk. I set out to write something rooted in my American heritage. I wanted it to feel American...but not to the point of losing ecumenical sensibilities. I've lived in Europe and Asia and I wanted to draw from those experiences too, in order to make the world feel real. But deep down, under the clashing tech and magic, below the misappropriated labels, I wanted this story to echo clearly with things I had experienced growing up in America. I wanted it to feel startlingly familiar despite all the strangeness going on in the text. That's what I wanted. Whether I succeeded in any of this is really up to the reader. MH: I think you succeed on most of those fronts. I'm glad you mentioned New Weird. That appears to be one of those genres that no one can quite agree what it is exactly. So to you what makes a story a New Weird story? HUSO: Ha, right. So we're back to thrashing out labels that will let us know what we're talking about. /me grins. I don't know. I feel like some people think new weird is either some kind of priggish re-branding of nothing-different-than-fantasy, or that it's just a fad term that's already come and gone. For me, I don't really care what the thing is called as long as it's fantastic. I mean, for me the issue is with quality and creativity rather than genre or label. Let's assume there is no new weird. The phrase isn't coined. So it's all just fantasy literature, in one big pile. You could still sort it out into stacks of stories that use dragons and elves and giants and fairies (the list goes on and on) as magic beans in a bag. Some fantasy writers toss this bag over their shoulder and expect the "magic" of the beans to grow them a great big fantastic story. Maybe they nurture the beans by sprinkling them with an epic purpose. Good wins vs evil. Whatever. What they get instead is the weakness you'd expect from leaning on a crutch instead of walking on your own two feet. The labels are to blame. Example: Thomas rounded the corner and there, before him, was a unicorn, its horn shining in the sun. The label is telling everything, to the point that even if the author actually tried to describe the creature's head, or the fine hairs around its muzzle, the point is moot. The reader would, end the end, ask: why didn't you just tell me it was a unicorn? And there you have it. Fantasy without the fantastic. Things that are fantastic are generally fantastic because they are new. And new is almost synonymous with strange. I'm more comfortable calling a story cool than I am trying to foist the label of new weird on it. It's new if it surprises me with its novelty. It's weird if it conjures up emotions that I cannot easily define. It's kind of obvious when you think about it. Why don't we just rename to genre to "Fantastic" and then let readers decide whether a given story meets the bar. MH: You've mentioned your work in video games and background as a MOD gamer before. If you could write a story for any media tie-in (Star Wars, Halo, etc) what would it be and what would you do with it? Even properties that haven't gone the book route apply. We're dreaming here. Or does the whole idea abhor you? HUSO: I'm not utterly repelled by the notion, but it doesn't excite me when we talk about it in abstract terms. Star Wars and Halo, being concrete examples, excite me even less. (I'm a huge fan of the latter by the way and I liked Star Wars a lot before George Lucas went insane) but those settings and dramas are known entities. For me, this is the difference between fan fiction and the real deal. The real deal is when I played Halo for the first time and I came around the corner and found myself toe to toe with a "hunter". The grunts it produced, the difficulty I initially had in understanding its body-shape, the overwhelming size of it, not to mention that it killed me almost instantly and that my bullets bounced off its metal "skin"...that was fantastic. I was afraid of this thing. It was a terrific and terrifying moment. When I met the Flood for the first time, it happened again. Halo did a great job of revealing its new creatures and environments in startling and dramatic ways. But anyone who reads a Halo book is going to know what a hunter is; what the Flood are. In this case, a hunter becomes just like a unicorn. It's a predefined and labeled thing when I'd rather be wowed by something new. I guess I'd have to really, really, really love the fiction in order to want to try to bring something new to someone else's world and most importantly to someone else's fans...who by the way are going to bring something more important than whatever is in the writer's head: a very heavy set of expectations. 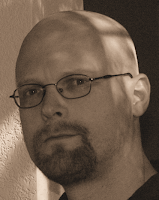 MH: Has your work in video games played into your writing at all? HUSO: All the creative stuff I do is probably linked in at least tangential ways. Clearly, video games are very visual (duh) and designing them requires an eye that's trained to see details. If my descriptions are particularly vivid, it might stem from that kind of predisposition. MH: How did Sena evolve as a character? She certainly has two very different sides from her as a seductress/manipulator and also a scholar plus there is the whole mad lovey side of her towards the end. HUSO: Despite the many things Sena does in the story, she evolved primarily out of a need for a villain in the plot. Not an evil hooded figure, but a subtle thorn, and an obvious Achilles heel for Caliph. She's terribly self-serving and her acts of charity are debatable and few. Having said that, Sena is still meant to be a character that provides the reader with a supportable preference in either hating or loving her and I think, despite her capriciousness, there's a sincerity to almost everything she does. I wanted her to be a character that readers could argue about. MH: What played into the decision to use airships in the World of The Last Page? Nowadays when anyone hears about that they immediately think of Steampunk and The Last Page is a lot of things, but it isn't Steampunk. HUSO: Yeah, but this book is, as noted earlier sort of disrespecting some boundaries in what I think is a good way. Zeppelin's are cool. I like them. Plus the Duchy of Stonehold is described as a backwards country, far behind the technology of the south. Zeppelins help evoke that setting because they are associated with steampunk. Thanks steampunk! Besides, zeppelins are lovely majestic giant things sliding quietly through the sky. I love me some zeppelins. MH: Zeppelins are most definitely a helluva a lot of fun. After the amazing events of The Last Page what can we expect out of Black Bottle? Will we get to see more of the south? And is there a confirmed release date? HUSO: In fact, a huge chunk of Black Bottle does, in fact, take place in the south. As for what you can expect, it's really just the other half of the story. You could lump both books together in a significantly fatter volume and have one novel. At least, that's the idea. No confirmed release date yet. I need to get my revisions in before that get's nailed down. MH: Were there any books in particular that turned you into a Sci-Fi/Fantasy fan? Or any authors who influenced your own style? Really, if you haven't read these folks, you should. All three of them are amazing. MH: Have you thought about what you'll be working on after Black Bottle? Is there any short story work in your future? HUSO: Well, I don't know if I'm any good at short stories. They're a different sort of animal. I did submit a short to a place on line that functions as a tie-in with both The Last Page and Black Bottle. Essentially it bridges the gap between the two books. Hopefully it gets picked up. If not, I'll probably post it on my site. As for what comes after Black Bottle, I do have a novel in mind and I've done some work on it. A few chapters is all. Once my revisions are done, I hope to move back to it. For the moment, though, that's all I'm saying. HUSO: Being from Minnesota, I must say that there is *nothing* in the world better than a real life mad bomber hat lined with rabbit fur. So, so toasty warm. MH: I'll have to track one down to add to my collections. What are two things most people don't know about you? Do you keep a monkey sequestered in your backyard? MH: Is there anything else you'd like to add? HUSO: Thanks so much for the interview. Feel free to visit my pseudo-blog.